Rob Cesternino and Akiva Wienerkur aren’t going to be dipping their heads in oil, but the did get together once again to recap the latest episode for Seinfeld: A Post Show Recap. 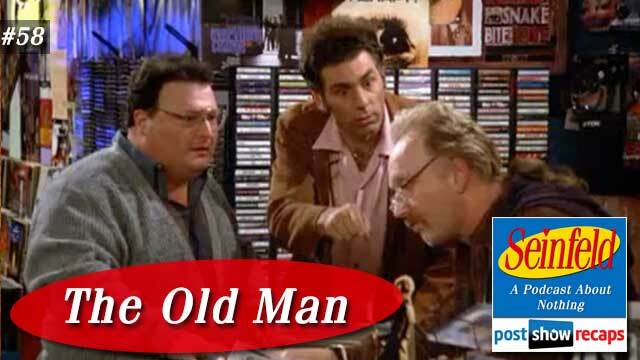 This week, they break down “The Old Man”, which first aired February 18, 1993 as part of season four. As always, there was a bit of current Seinfeld news this week. Rob took Hulu for a spin to watch this week’s episode, and enjoyed having the option, and even thought that the commercial interruptions weren’t terribly frequent. His one complaint was about the less than great video quality. Akiva shared that it was Larry David’s 68th birthday the day they taped the podcast. Also, he went further in depth about some of the media rankings of Seinfeld shows. The list done for New York Magazine that Akiva had noticed was missing an episode turned out to be completely different than Akiva’s, ranking many of Akiva’s least favorites fairly high. He did point out that Vanity Fair’s list was much more in tune with his opinions. Before answering the Seinfeld Scene It trivia question, Akiva thought to point out that the questions should really be about episodes they already watched, but Rob vetoed that quickly. Akiva was correct in guessing this week despite it being from a later season, bringing his record to 1-1. Jerry’s opening stand-up is a bit about life expectancies being so much higher than a thousand years ago. The episode opens with George lamenting his lot in life to Jerry at the diner, deciding that he wants to date a woman who doesn’t speak English, while Jerry suggests dating a mute. Elaine comes in, suggesting George could find some fulfillment from helping the elderly like she’s doing. He seems keen on the idea, while Jerry scoffs at it. Rob pointed out that this episode had a lot of great lines in it despite lacking a great plot. Elaine ends up convincing both Jerry and George to volunteer for the organization she’s joined. At Jerry’s apartment, Kramer comes in and quickly admonishes Jerry and George for volunteering, calling it all a scam. Rob thought this line didn’t end up paying off, with Akiva thinking it’d been funnier to have Kramer afraid of old people. Newman then comes in, and he and Kramer share their plan to sell used records, asking Jerry for his old records to help the cause. George is prompted to ask Newman what he does for a living, and Newman goes on a rant about how postal workers go crazy because the mail never stops. Rob explained to Akiva that this theory is where the saying “going postal” comes from. In the next scene at the record store, Kramer and Newman are floored when they are only offered $5 for all of Jerry’s records. Rob shared that he’s sold some DVDs and video games during some tighter times in his youth, while Akiva had never, since he hates money. Meanwhile, Jerry shows up at old man Sid’s apartment that the agency assigned him, but the old man doesn’t want him there, yelling at him throughout the whole visit. Before leaving, Jerry learns that Sid is getting rid of all his records, prompting him to offer Kramer and Newman to come take them off his hands. George is at the diner with the old man he was assigned, peppering him with questions about how he deals with oncoming death. The old man explains that he just doesn’t care about that, and when George keeps with the questions, he finally walks out on George, leaving him with the bill. As Elaine walks in to visit with her old lady, she immediately gasps, since the lady has a giant goiter on her neck. Elaine does her best to not look horrified, but not very well. Jerry, George and Elaine all recap how their visits went, and all three want out of their situations. Kramer and Newman come in, with Kramer telling Jerry he embarrassed him with having such cheap records. Jerry shares that his old man Sid has a ton of great records that they can just have, so they all head over there. At Sid’s apartment, George is immediately entranced by Sid’s helper from Senegal, finding his woman who doesn’t speak English, and tells her that he wants to dip his head in oil and rub it all over her. As Newman and Kramer start to gather up the records, Sid starts yelling at them, ultimately kicking Kramer in the rear end. During the tussle, he also bites Kramer’s arm. When Kramer flings his arm free, Sid’s false teeth fly through the kitchen, ultimately getting crunched in the garbage disposal when George turns it on thinking it was a light. Jerry gathers them all up so they can take Sid to a dentist to fix the teeth. Outside, they all pile into the taxi, but realize that Sid is not with them. Meanwhile, Elaine is with her old lady Mrs. Oliver, where she is telling Elaine how she had an affair with Gandhi, and he used to dip his bald head in oil and rub it all over her. There is another quick scene cut to Kramer and Newman at the record store, and this time they are only offered $20 for all of Sid’s records. Kramer stands behind Newman whispering insults for Newman to call the shop owner, causing him to hop over the counter and attack them. Back at Jerry’s apartment, Jerry is getting yelled at by the agency lady for losing Sid. Sid’s son then comes up to figure out how Jerry lost his father, then learned that they took his father’s valuable records. They decide to call Sid’s house to see if he went back, and the phone is busy, so they all head over. When they show up, Sid is not there, but George is, and Sid’s aid is wearing a robe and rubbing his head in oil. The final scene is George and Jerry’s old guys having a “nothing” type conversation at the diner, much like an older version of Jerry and George. Jerry’s final stand-up is a bit about how old people get smaller, but their cars tend to get bigger. Both Rob and Akiva agreed that this episode was a bit weak in comparison to those surrounding it, with Akiva ultimately ranking it at 139, though he’d give it a better spot if he were to rank them again. If the episode were to have aired in 2015, Rob and Akiva felt that the internet would be an easier way for Newman and Kramer to sell used records. There were just a couple emails this week. Amir wrote in to share that he too felt this was a bit of a broad episode, though it was enjoyable. He also wondered why George would touch the dentures in the sink, but Akiva pointed out that it’s Jerry who’s the germaphobe, while George eats éclairs out of the trash. Chester also felt this was a mediocre episode, but wanted to write in to share his list of ugliest presidents (a link to this list was provided by Akiva in the comments of this page). Tune in next week as the guys will recap “The Implant”, where Rob and Akiva hope to have a podcast that’s real, and spectacular. Send in your questions by emailing [email protected]. Don’t forget to subscribe to the podcast by going to postshowrecaps.com/seinfeldITunes where you can rate and review the podcast. And as always, you can follow them on Twitter @robcesternino and @keev26.